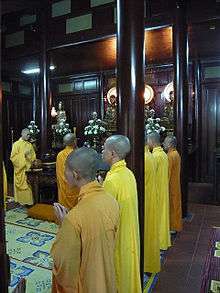 Buddhism in Vietnam (Vietnamese: 'đạo Phật or Phật giáo') as practiced by the ethnic Vietnamese is mainly of the Mahayana tradition. 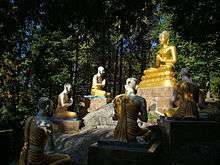 Buddhism may have first come to Vietnam as early as the 3rd or 2nd century BCE from South Asia or from China in the 1st or 2nd century CE. Vietnamese Buddhism has had a symbiotic relationship with certain elements of Taoism, Chinese spirituality, and the Vietnamese folk religion. During the Đinh dynasty (968-980), Buddhism was recognized by the state as an official faith (~971), reflecting the high esteem of Buddhist faith held by the Vietnamese monarchs. 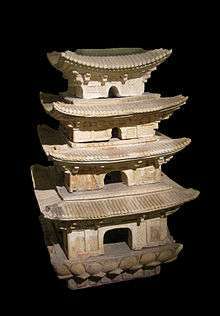 The Early Lê dynasty (980-1009) also afforded the same recognition to the Buddhist church. The growth of Buddhism during this time is attributed to the recruitment of erudite monks to the court as the newly independent state needed an ideological basis on which to build a country. Subsequently this role was ceded to Confucianism. With the fall of Saigon in 1975, the whole nation came under Communist rule; many religious practices including Buddhism were discouraged. Organized sangha were suppressed. In the North the government had created the United Buddhist Sangha of Vietnam, co-opting the clergy to function under government auspices but in the South, the Unified Buddhist Sangha of Vietnam still held sway and openly challenged the communist government. The Sangha leadership was thus arrested and imprisoned; Sangha properties were seized and the Sangha itself was outlawed. In its place was the newly created Buddhist Sangha of Vietnam, designed as the final union of all Buddhist organizations, now under full state control. Today, Buddhists are found throughout in Vietnam, from North to South. Buddhism is the single largest religion in Vietnam, with somewhere between 9% and 16% of the population identifying themselves as Buddhist. The most famous practitioner of synchronized Vietnamese Thiền in the West is Thích Nhất Hạnh who has authored dozens of books and founded the Dharma center Plum Village in France together with his colleague, bhikṣuṇī and Zen Master Chân Không. According to Nguyen and Barber, Thích Nhất Hạnh's fame in the Western world as a proponent of engaged Buddhism and a new Thiền style has "no affinity with or any foundation in traditional Vietnamese Buddhist practices"  and according to Alexander Soucy (2007) his style of Zen Buddhism is not reflective of actual Vietnamese Buddhism. Thích Nhất Hạnh often recounts about his early Thiền practices in Vietnam in his Dharma talks saying that he continued and developed this practice in the West which has a distinctive Vietnamese Thiền flavor. The methods of Pure Land Buddhism are perhaps the most widespread within Vietnam. It is common for practitioners to recite sutras, chants and dhāraṇīs looking to gain protection through bodhisattvas or dharmapalas. It is a devotional practice where those practicing put their faith into Amitābha (Vietnamese: A-di-đà). 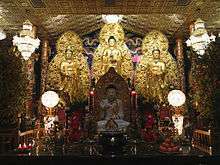 Followers believe they will gain rebirth in his pure land by chanting Amitabha's name. A pure land is where one can more easily gain enlightenment since suffering does not exist. Many religious organizations have not been recognized by the government however in 2007, with 1.5 million followers, The Vietnamese Pure Land Buddhism Association (Tịnh Độ Cư Sĩ Phật Hội Việt Nam) received official recognition as an independent and legal religious organization. A new Thiền school was founded by King Trần Nhân Tông (1258–1308); called the Trúc Lâm "Bamboo Grove" school, it evinced a deep influence from Confucian and Taoist philosophy. Nevertheless, Trúc Lâm's prestige waned over the following centuries as Confucianism became dominant in the royal court. In the 17th century, a group of Chinese monks led by Nguyên Thiều introduced the Ling school (Lâm Tế). A more domesticated offshoot of Lâm Tế, the Liễu Quán school, was founded in the 18th century and has since been the predominant branch of Vietnamese Zen. Some scholars argue that the importance and prevalence of Thiền in Vietnam has been greatly overstated and that it has played more of an elite rhetorical role than a role of practice. The Thiền uyển tập anh (Chinese: 禪苑集英, "Collection of Outstanding Figures of the Zen Garden") has been the dominant text used to legitimize Thiền lineages and history within Vietnam. However, Cuong Tu Nguyen's Zen in Medieval Vietnam: A Study and Translation of the Thien Tap Anh (1997) gives a critical review of how the text has been used to create a history of Zen Buddhism that is "fraught with discontinuity". Modern Buddhist practices are not reflective of a Thiền past; in Vietnam, common practices are more focused on ritual and devotion than the Thiền focus on meditation. Nonetheless, we are seeing an increased population in Zen today. Two figures who have been responsible for this increased interest in Thiền is Thích Nhất Hạnh, currently residing in France, and Thích Thanh Từ, who lives in Da Lat. From Saigon, the Theravada movement spread to other provinces, and soon, a number of Theravada temples for ethnic Viet Buddhists were established in many areas in the South and Central parts of Vietnam. As of 1997, there were 64 Theravada temples throughout the country, of which 19 were located in Hồ Chí Minh City and its vicinity. Besides Bửu Quang and Kỳ Viên temples, other well known temples are Bửu Long, Giác Quang, Tam Bảo (Đà Nẵng), Thiền Lâm and Huyền Không (Huế), and the large Thích Ca Phật Đài in Vũng Tàu. ↑ Cuong Tu Nguyen & A.W. Barber. "Vietnamese Buddhism in North America: Tradition and Acculturation". in Charles S. Prebish and Kenneth K. Tanaka (eds). The Faces of Buddhism in America. Berkeley: University of California Press, 1998, pg 130. ↑ SNIE 53-2-63, "The Situation in South Vietnam, 10 July 1963 Archived April 1, 2010, at the Wayback Machine. 1 2 "Pure Land Buddhism recognised by Gov’t." Viet Nam News. December 27, 2007. Accessed: April 7, 2009. ↑ Đâu là con số thực về tín đồ Phật giáo Việt Nam? Archived January 15, 2013, at the Wayback Machine. ↑ Cuong Tu Nguyen & A. W. Barber 1998, p. 131. 1 2 Alexander Soucy 2007. 1 2 Cuong Tu Nguyen & A. W. Barber 1998, pg 135. Buswell, Robert E., ed. (2004). "Vietnam", in Encyclopedia of Buddhism. Macmillan Reference USA. p. 879-883. ISBN 0-02-865718-7.